As with previous ventures out for the night the Ghost Connections team occasionally make a foray into the unknown looking for possible venues or purely to research reported haunted locations or places of historical interest. On this occasion Ian had returned earlier that day from holiday and as such a full investigation had not been scheduled and the rest of the team eventually settled on back tracking over last years explore at West Kent so that Ian could join us for at least some of the night. It also provided us with the chance that should we wish to spend a little longer with an actual investigation somewhere if the mood took us. Back on the list for a revisit were Speldhurst, Southborough and Hartlake Bridge. Along the way we found both things to laugh about and things that irritated us, and people we can write about along with places that inspired us and those which we still seek some answers on. If you can add anything to the history of the locations mentioned please contact us. In 2008 we had ventured along part of the ancient drovers road from the Rusthall end. Due to the inclement weather we had abandoned this and would take this opportunity to return and in doing so would answer one of the questions of the previous visit. The drovers road is an age old route from Rusthall at Tunbridge Wells to Speldhurst village and beyond. Speldhurst may be little heard of now but the parish previously covered most of Tunbridge Wells before the town existed. It was a centre for the Wealden iron industry and farming and the remains of both can be seen hereabouts. Finding the end of the drovers road near the village was easy and there is just room to safely leave your car at the end. Daylight was fading as we got there and so went equipped with torches. As we rounded the first corner the remains of the ancient forest were obvious. Age old trees grew from the sides of the cutting that is the track-way in an image that stirs the imagination and almost takes you back to the past. The gnarled roots barely seeming enough to hold them to the bank. Following the route as is clearly worn in the landscape we then came to a split in the path and hearing voices ahead we opted to take the lower path. This lead us down to what must, in daylight, be a tranquil stream within the woods although this did explain the sound of water we had heard before. A small bridge leads to a footpath to open country beyond the stream. Whilst walking along the stream there came the most weighty crashing through branches to our left. What seemed like a heavy object continued for a few seconds and landed with a heavy thump on the ground. Whilst it is accepted we could only generalise where this had come from we scoured the area but could find nothing. Had the object been a living creature it would surely have run upon landing but there was no further sound. Had we come across a big cat dropping its dead prey or a paranormal event or some unknown natural event? We will never know for sure but it really made Dave jump for the first time in 5 years of roaming in the dark! Next destination was Southborough Churchyard. 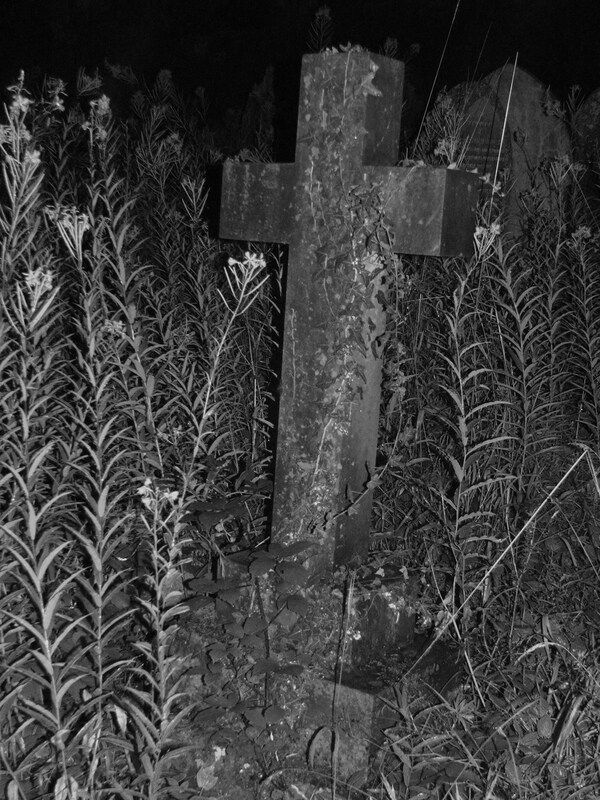 Ever the perfect image of Gothic creepiness the majority of the tombs lay at the back and are now overgrown and forgotten. Ivy and weeds have taken over. It is the casual thrill seekers paradise but does it hold anything of interest to the competent investigator of the paranormal? We meant to find out. Finding no local hatch drivers parked on the common we thought we could enter undetected although paused for a coffee at the car first during which time a passing police patrol checking the lane decided that four figures lurking in black were not worthy of attention whilst cups were in hand. Onwards into the churchyard and in appearance it was all we thought and remembered. Willowherb high above our heads dwarfed the Victorian headstones and invertebrates were everywhere. Impressive, if you can call them that, slugs and probably the biggest Woodlice you could ever see. Did we find any hint of the paranormal? No, we did not. We next planned to spend the rest of the night at Hartlake Bridge, the scene of a tragic Victorian disaster where hop-pickers lost their lives when the old bridge collapsed due to the fast moving Medway being in full flood. On the way we paused at somewhere we have endeavoured to research with no avail. Just into Hartlake Road prior to the rail bridge is a cemetery. It has no signage and no clue as to its history, age, dedication or owner. We figured if we knew who was within then we may be able to solve this mystery. Alas this was not to be the case. We parked in a field entrance immediately nearby and got out the car. A Range Rover drove past and reversed then stopped. Driven by a female the male passenger got out in a fluster. Wearing a shirt and tie he approached us. Let it be known that Ghost Connections have never entered any premises by causing damage, trespassed on signed private land or opened gates that are plainly secured and neither do we advocate any such behaviour as readers of previous reports may have noticed. If challenged we always explain what we are doing and if asked to leave will do so with no fuss. This male approached us to shouts of 'What are you doing?' repeated and in an increasingly agitated manner. When he was within a suitable conversational range we answered his question in the most honest way possible 'Being nosey'. Well we were! Possibly disbelieving or just plain rude he continued with the same question at which time he was reminded that he had been provided the answer and was asked not to be quite so rude. In a continued aggressive manner he continued to state that he owned the field, the land and 'that there' which we took to mean the cemetery. In normal circumstances with a reasonable person we would have inquired further but this opportunity was not going to arise. With glares it seemed he was waiting a response of some further explanation until rationalism took over. We asked, 'So are you asking us to leave?'. He continued to ask what we were doing and was told we had already provided that answer to which eventually he conceded that he would like us to leave which we agreed to do. On his return to his vehicle it was apparent a female shoe had escaped and was in the road which we pointed out and he was thankful. We smiled. We are tempted to say that it's all in the wording. If you ask the right questions in the right way then you get the right answers. We appreciate that 'Being nosey' is not nearly as dramatic as 'We are going to sacrifice virgins in your graveyard' but what else do you say when it's what you are doing? Some people. That said, if any readers know anything about this cemetery then please contact us. From here we went to Hartlake Bridge and spent the rest of our time there. We chatted, laughed and generally discussed the interests we share and considered this as a venue whilst spotting fishes, swans and viewing the setting moon. This is a location that is surely evocative to many people who lost relatives in the disaster yet for us it holds little in the paranormal sense other than perhaps an air of tranquillity. Perhaps all the souls who perished here are at rest. The night over we decided we needed our rest and concluded the evening.